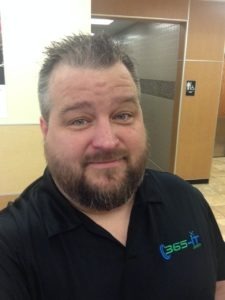 Mike Crews, owner of 365-IT, has served the IT Support and computer repair needs of the business community since 2003 with a commitment to long term client driven business relationships. He brings the same commitment and expertise to the client regardless of company size. From one to a thousand systems each project receives 100% attention until the task is complete. Mike is proficient and current with hardware and software; which allows him to have a solution to each IT support challenge your business may encounter. He leads our team by example working directly with clients. The company name was intentional because Mike understands with any business large or small time is money and will dedicate the services and man power needed 365 days a year. Mike wants to make a difference as a part of your team in designing new systems with top of the line hardware and software as well as providing effective solutions through preventive maintenance and continual monitoring. Knowing your system ensures a quick response to avoid costly down time. Mike leads are team with a strong dedication to education and training for himself and the staff to keep current on the industry. Being a native of the area he has seen the amazing growth and the need for an honest and dependable service provider. With the constant threat from catastrophic viruses and malware, maintenance and monitoring of all systems provides the ability to update the client’s hardware and software. We want to be the “IT” for the small business and support to the technical staff of the large businesses. We are committed to establishing a long term relationship with our clients. Our goal is to service our clients by staying current on all the industry has to offer. We want to be the “safety net” and offer the peace of mind everyone wants for their company. Relationships are built with a long term commitment to service not a quick buck, constant changing staff mentality so many providers offer.